Subway is one of America’s best-known sandwich restaurants. It has a relatively simple menu of sandwiches, all custom-assembled in front of customers. It has set the standard for how sub chains operate in the United States, taking the basic operations of the neighborhood deli and adapting them for chain stores. One thing that has always stood out about Subway is its logo. Though simple, it is very easy to identify. The purpose of this article is to take a look at the Subway logo desing elements and its history and determine how it’s aided in the company’s rise to prominence. The current Subway logo is incredibly simple, but in that simplicity lies a fantastic marketing strategy. By leaving nothing to the casual observer but the name, Subway has been able to indelibly link a pair of major colors and a pair of arrows in the public eye. The major shape of the logo is nothing more than the words SUBWAY with an arrow on the S and the Y. These arrows represent movement and speed, both elements that are meant to portray Subway as the restaurant of active patrons. Though never overt, the shape helps to subconsciously link the company with healthy activity. The font and color are two consistent elements throughout the year. The simple, blocky letters make it very easy to identify as Subway from the road or mall walkway, helping to draw in customers. The colors, yellow and green, are indicative of health foods – something that works well with Subway’s major goal of positioning itself as a leader in the world of healthy eating. The initial shape of the Pete’s Subway logo has little in common with the modern logo, save for the arrows on the word Subway. By 1968, though, the shape mostly solidifies with the word SUBWAY and the arrows as the major element. These elements consistently helped remind the public that Subway was a restaurant for those who were active and on the move, helping to reinforce how different it was from traditional fast food. The only major shape change since 1968 has been the dropping of the oval background, leaving the word SUBWAY alone in the logo. Subway initially used a dark yellow font, which was easily seen on its first storefront. By the time its second logo rolled around, the yellow would be brightened and paired with white and placed on a green background – all colors that represented health. These three colors would remain as the years went by, first by moving green to an outline and then to the secondary color of the logo. This kept Subway’s commitment to freshness and healthy ingredients in the public eye. The initial Subway logo featured a common 1960s font, featuring not only the Subway name but rather the full name of the restaurant – Pete’s Subway. In 1968, the logo’s font changed slightly, dropping ‘Pete’s’ but keeping the arrows on the letters. By 1982, the company dropped the background and italicized the font. By 2016, the italicization was dropped and simplified to a look reminiscent of the 1968 logo without the green background. Subway’s logo is, for the most part, a relic of the 1960s. The initial logo is similar to what you’ll still see in neighborhood delis, though the modern logo has changed enough that it’s more in line with clean-eating chain restaurants. In fact, the latest logo alteration is definitely an attempt to follow in the footsteps of other businesses that have radically simplified their logos in the latter half of the 21st Century. Subway’s logo has, however, been copied by many other similar businesses. The old text-on-oval logo is still standard in the sub chain business, with companies like Lenny’s and Jersey Mike’s using variations on the same theme. Subway is a shortened form of the company’s original name, Pete’s Super Submarines. Subway’s founder, Fred DeLuca, was 17 years old when he founded the company with a thousand dollar loan from a family friend. The Subway logo is simple but effective. It has evolved significantly since its earliest days, but the evolution still clearly points back ot its origins. If nothing else, the logo proves that simpilcity is sometimes the best way to establish a brand. With only its name, Subway has managed to become the go-to for deli-style sub sandwiches in the United States. 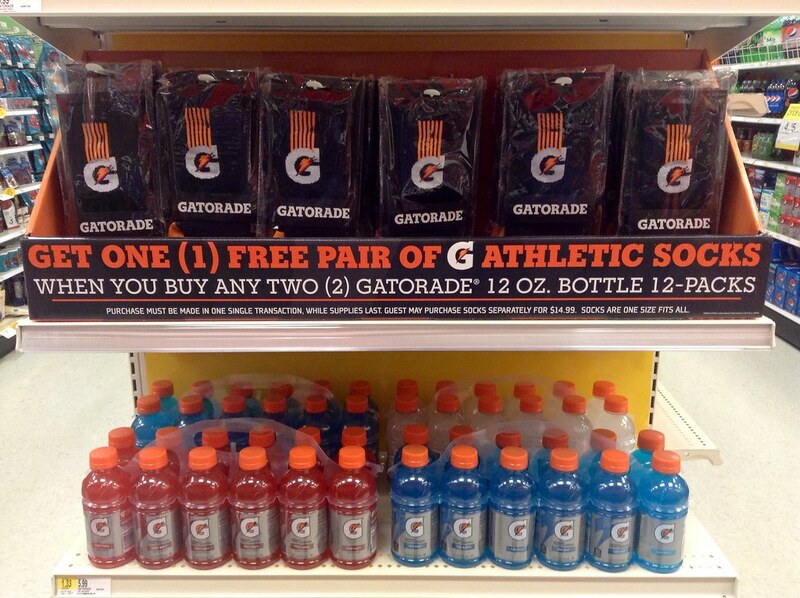 Over the years, Gatorade has become a staple of refreshment, sportsmanship, and victory. The Gatorade logo is one of the most instantly recognizable logos in the world. Currently manufactured and distributed by PepsiCo in more than eighty countries, the sports drink is one of the most famous beverages in the world. Developed at the University of Florida in 1967, the sports drink has had a long and complex history. It has changed owners twice since it was first created by Stokely-Van Camp, going to the Quaker Oats Company in 1987 and then to PepsiCo in 2000. It accounts for more than 75% of the sports drink market share in the United States, and it is PepsiCo’s 4th largest worldwide brand. Arguably, the most iconic design element of the Gatorade logo is the lightning bolt. The lightning bolt design element was first introduced in the 1970s. The brand name, written in a dynamic, sans-serifs font, has always been part of the Gatorade logo. From the 1970s up until the major rebranding of 2009, the Gatorade logo was composed of the iconic Gatorade lightning bolt, and the Gatorade brand name written in a white rectangle. Throughout its history, the Gatorade logo has maintained a somewhat retro look, compared with other sports energy drinks logo, such as the Monster logo. Other than the first rebranding from 1970, the Gatorade logo has remained mostly the same until the 2009 rebranding, with only minor changes. Those changes mainly revolved around the Gatorade logo font and around the white quadrilateral frame around the logo. 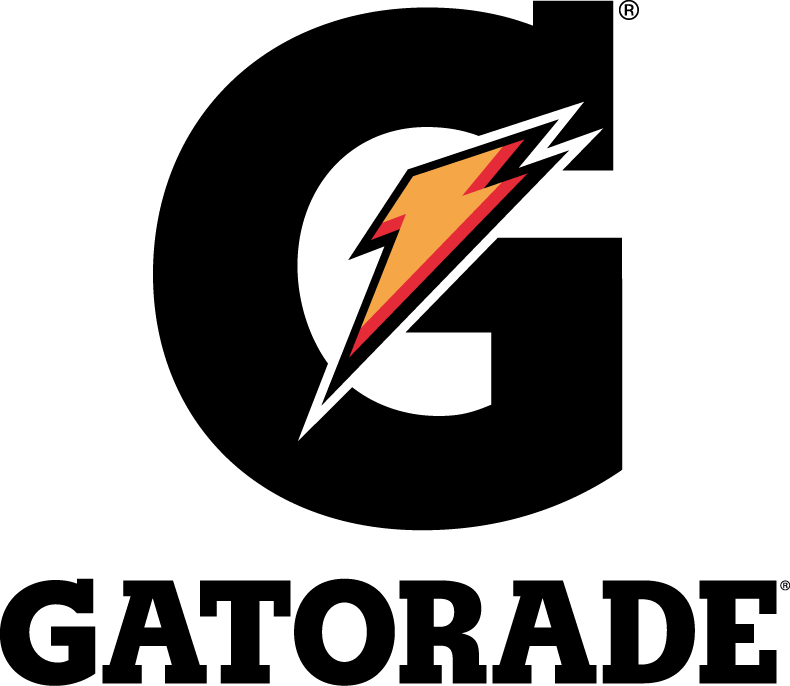 The Gatorade lightning bolt became more and more prominent throughout the years, until the 2009 rebranding. This is the element most people associate with the Gatorade logo, and the one which makes the brand logo so easily recognizable. In 2009, the Gatorade logo went through a complete makeover. The lightning bolt took center stage, superimposed on a gray, flat G letter. The Gatorade brand name was dropped completely from the design. The lightning bolt was also changed, to give it a more dynamic, even comic-book feel. This major rebranding didn’t go well with the public, so for its 50th anniversary, Gatorade reverted to an older logo design, which looked similar to the orginal 1970s logo. The first Gatorade logo, developed in 1965, when the drink first came out, simply consisted of the words Stokely Van Camp’s Finest Gatorade written in black. The logo lasted for five years, until the lightning logo first came into the public eye, bringing with it the image that would be best associated with the sports drink up to this day. It was a simple, stylized lightning bolt, placed behind the Gatorade name and behind the classic ‘Thirst Quencher’ moniker. The white frame also contained the flavor of the beverage and the disclaimer that the drink was artificially flavored and that it contained no fruit juice. Over the years, a number of changes came over the old Gatorade logo. They mostly involved simplifying the logo, changing the font a little, and getting rid of everything other than the frame, the Gatorade name, and the ‘Thirst Quencher’ moniker. In 2009, the Gatorade logo was thoroughly simplified, to include just the lighting bolt and a large gray G letter. Subsequently, the classic orange and green color scheme were dropped. The 2009 Gatorade logo had very little to do with the classic logo. The classic Gatorade colors are orange, green and white. The lighting bolt Gatorade symbol is usually orange, though throughout its history it has included yellow as well. The Gatorade brand name is usually written in green and placed on a white rectangle across the orange lightning bolt. When the Gatorade logo was redesigned, so was the color scheme. The green of the logo name disappeared completely. Instead, the letter G was colored in either gray or black, depending on the context. The classic Gatorade font is a custom typeface created for the brand. It is a simple, blocky, sans-serifs font. Throughout the years, the Gatorade font hasn’t changed its shape much, though it did have a tendency to become narrower in each rebranding phase. The 2009 version of the Gatorade font maintained the blockiness of the font, with the addition of small, barely noticeable serifs. The most well-known element of the Gatorade logo, works as a simple, clear metaphor for what the drink has to offer. It symbolizes power and raw energy, precisely what this iconic drink promised to give customers. 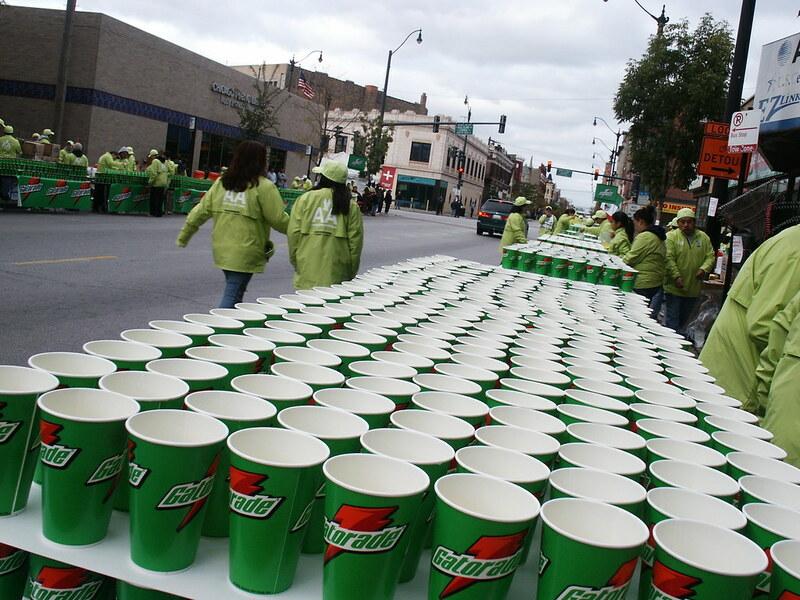 The bold orange and green colors symbolized vitality and energy, an essential part of the Gatorade promise. The simple and dynamic font of the Gatorade logo further reinforced this point. Arguably, this is one of the reasons why the 2009 Gatorade logo was not well received. In trying to update the look and feel of the logo, designers removed many of the elements that stood for the Gatorade message. Instead, the newer Gatorade logo seemed to focus more on the brand than on the message. The sports drink was developed by a team of scientists at the University of Florida, to help the local football team, the Gators. Players would frequently collapse on the field due to heat and exhaustion. This football team was the inspiration for the brand name, Gatorade. Walmart was originally founded as a small chain of retailers in 1945, but its low prices quickly attracted customers. The company is now the largest supermarket company in the world, and they are known for selling furniture, clothes, tools, food, electronics, and almost everything else. Over the years, the Walmart logo has changed several times, to better represent their image. To find out the reasons behind Walmart’s current logo design, keep reading this article. We will share details about the interesting past of the Walmart logo. Walmart’s current logo features both a wordmark and an image. On the right side of the logo are six yellow dashes arranged in a circle. The narrower ends of the dashes point inwards, and the thicker end goes outwards. This creates an image similar to a flower, sun, or star, and Walmart calls it “the spark.” On the left side is the brand name, “Walmart,” in blue letters. The font is similar to the classic Myriad Pro font. This is a sans-serif font that primarily uses even thicknesses, but the lines narrow slightly along the curves of the As, Ms, Rs, and Ts. The graphic designers responsible for the logo also made some changes to customize the font. Most of the tips of the letters end in a blunt, straight line, but the lower tips of the W and the A gently curve out into a point. When the company was first founded, the original logo said “Wal-Mart,” and it did not have any accompanying image. This sort of logo was used from about 1964 to 1992, with only a few minor changes. Starting in the early 1990s, Walmart changed to a logo that used a star instead of a standard hyphen, to create a more exciting logo. This logo remained consistently in use until the spark logo was unveiled. Until 1981, Walmart did not have any specific color associated with their logo. They just used a basic black on white design. This changed when the company switched to a trendy brown color that made them look responsible and reliable. By the 1990s, brown looked bland and out of date, so the logo was changed to its classic blue color. Navy blue was a key color in Walmart branding for years, but this changed in 2008 when the blue of the logo was lightened slightly. Walmart’s first font had all-capital letters with exaggerated, arrowed serifs, and this was called “The Frontier Font.” The logo became simplified when it adopted the classic bold, sans-serif font in the 1980s. The same font showed up in both the brown and blue logos. It was eventually updated to a lower case font when the spark logo was created. Walmart’s decision to change their logo so drastically in 2008 was part of a company-wide push to look friendlier and less corporate. The company was getting a bad reputation due to its unethical business practices, so they needed a logo that looked youthful, cheerful, and approachable. Using lowercase lettering results in a more casual and less intimidating sign, while retaining the capitalized W and sedate blue color scheme helps ensure that the logo still looks reliable. The organic flower or sunburst shape that replaced the geometric star further increases the Walmart logo’s casual appearance. The color for Walmart’s new logo is actually the color used in the old logo for Sam’s Club, which is a bulk retail store run by Walmart. Changing the logo on all stores is a massive and expensive undertaking. Almost a decade after the spark logo was created, rural Walmart storefronts still have the star logo. Most people know that Walmart’s name is a shortened form of founder Sam Walton’s name, but many are surprised to learn that Walmart was originally called Wal-Mart Discount City. The versatile design of the Walmart logo makes it suitable for appearing on everything from giant billboards to small product labels. Its casual and friendly appearance may help customers forget that Walmart is a huge corporation, yet the logo still looks responsible and trustworthy enough to attract long-time shoppers. Walmart’s upgraded logo has done an excellent job of carrying out the company’s marketing goals. Nestlé got its start as a small Swiss company in 1866 that marketed milk-based baby food. Once they began focusing on making milk chocolate, their business quickly grew. In modern times, Nestlé is an international food and drink company that owns popular brands such as Stouffer’s, Maggi, Nesquik, and Kit Kat. All of the various Nestlé products can be identified by the Nestlé logo. Keep reading to learn more about the interesting history and design of the logo. Nestlé’s logo is a simple black line drawing above black lettering that spells the brand name, and its background is transparent. The drawing at the top of the logo is a branch with three leaves that is holding a nest. A mother bird perches on the right of the nest, and she is bent down to feed the two baby birds that are sitting in the left side of the nest. At the bottom of the logo is the word “Nestlé.” The N is capitalized, while the rest of the letters are lowercase. A line extends from the left top corner of the N over the first E and the S. This line briefly stops to make room for the T and the L, and then it continues over the last E. As the line ends on the last letter of the word, it thickens and angles upwards slightly. Nestlé’s logo shape has undergone quite a few changes, even though it keeps the same overall theme. The first logo dates all the way back to 1868, and it was a detailed drawing of a mother bird feeding three babies in a nest. In 1938, the brand name, “Nestlé” was placed over the bird drawing. Over the next few decades, the line drawing was slightly simplified, while the brand name became bolder and larger. Beginning in 1988, the company started simplifying their logo to make it easier to print. They moved their name underneath the bird drawing, and one of the baby birds was removed. The logo has received updates two more times since then, and each update further simplifies and clarifies the bird drawing. Nestlé’s logo has always officially been black and white. When the brand name was first moved underneath the image, the letters were white with a black outline, but this has since changed to a solid black color. Until 1988, Nestlé used a classic Roman font with thick slab serifs and a traditional accent mark over the E. When they moved the name to the bottom of the logo, they changed to a more modern font that looks like a modified Helvetica, and uses the slanted line over the E to signify an accent. Much of the inspiration for the current company logo is actually from founder Henri Nestlé. When Nestlé began marketing his baby formula, he decided to create a logo that used his family crest, which showed a bird in a nest. This image was combined with the idea of a mother feeding her young to create the first Nestlé logo. Nestlé’s current logo still uses the same basic image, because they want to remind customers of their proud past. The bird in a nest image is one of Nestlé’s most iconic images, so the company kept it, even though it is much busier than most modern logos. To update the logo for the digital age, Nestlé removed a lot of the shading and texturing. Nestlé made this decision because they wanted the logo to still look good on smartphones and other small screens. Since “Nestlé” means “a small bird’s nest” in a high German dialect, the Nestlé logo does a great job of referencing the company’s German heritage. The three birds in the Nestlé logo represent Hans, Heinrich, and Samuel Nestlin, three brothers in the 1400s who founded the family. Due to the accent mark on the logo, the company ought to be pronounced “nes-lay,” but most Americans call it “nes-lee” due to their unfamiliarity with accented pronunciation. The Nestlé logo has gone through some subtle changes to make it work in the digital age, yet it still retains the appearance of the original logo. This historical logo reminds people of Nestlé’s origins as a baby food company, while also being broad enough to work as labeling for other products. It has been around for over a century, and Nestlé will probably keep the nest logo for years to come. Budweiser was founded over 140 years ago in St. Louis, Missouri in 1876. This brand of beer is known for its lager beers that have a light, neutral flavor and an affordable price. Each can and bottle of Bud contains the famous company logo. Despite many minor changes, Budweiser’s logo has remained very similar over the years. This creates a nostalgic effect that encourages consumers to remain loyal to their favorite brand of beer. In this article, we will take a look at how the Budweiser logo has changed to promote the brands beverages. Budweiser employees often call their logo “the bowtie” due to its signature shape. A bowtie shape is achieved by creating a shape that looks like a slanted rectangle with a triangle removed from its top and bottom. The bowtie is a solid red hue that contains a white outline when it is placed on the red Budweiser bottles. On top of the red bowtie shape is the word “Budweiser” which appears in bright white lettering. The wordmark for Budweiser is written with a curling script font that uses elaborate loops on the uppercase B. In areas where the white of the font overlaps or extends past the red bowtie, red shading is used to make the text stand out. Overall, the Budweiser logo is quite different from the logo of their most famous brand, the Bud Light logo. For many years, Budweiser did not even have their own logo. At first, the company just used the Anheuser Busch logo that contained an eagle flying through an A. Eventually, the brand of lagers became famous enough to warrant their own logo. They started out with a red rectangle that said “Budweiser” in white script that had a gold crown over the top of the B. This was meant to signify that Budweiser was the “king of beers.” The crown theme was carried over to the next logo shape, that was the famous bowtie symbol. It had a gold crown above the bowtie, and the bowtie itself contained a subtle striped background. All of these superfluous elements were removed in the updated version. Most of Budweiser’s logos have used a combination of red, white, and gold. The red is bold and appetite-stimulating, while the white is crisp and refreshing. Gold was used on many past logos to add a luxurious touch, but it was removed when the crown emblem was removed. Budweiser’s logos all use classic script fonts with a lot of loops and curls. This font has been slightly modified over the years. It was originally more italicized, and slightly less round than the modern version. The Budweiser logo Budweiser follows a recent marketing trend of simplifying past logos to create a cleaner look that still references traditional logos. This logo simplification helps to ensure that the logo still looks nice on tiny phone screens or in Instagram pictures. The decision to keep the traditional script and bowtie image ensures that it is still elaborate enough to decorate a beer can and appeal to traditional drinkers. Budweiser means “of Budweis” because the company founder was inspired by a style of lager from the Budweis region of Bohemia. Despite extensive documentation on their marketing history, Budweiser has no record of why they first chose a bowtie shape for their logo. Due to copyright disputes, the logo just says “Bud” on all bottles of beer sold in European Union countries. The Budweiser logo appears on a rather unusual type of beer. Unlike most lagers, which are made with wheat or barley, Budweiser is made with a 30 percent rice recipe. Budweiser’s most recent logo manages to combine modern graphic design trends with company tradition. The Budweiser logo is a clever design that makes the brand stand out from other popular beers. Its clean lines, bold colors, and distinctive shape allow the logo to look aesthetically pleasing on all types of drink containers and marketing campaigns.